The delicious flavour of our Parmigiano Reggiano PDO has its origins on Ferrarini’s farms: our special combination of milk from Frisona and Jersey cows, reared on our own farms, gives this extra-mature cheese the subtle taste that makes it unique. Every year, our fields produce enough fodder to make 50,000 hay bales, plenty to provide a healthy, balanced diet for our 5,000 cows. The 20 million litres of milk they produce every year is used exclusively in the production of our Parmigiano Reggiano and butter. Our cowsheds are home to nearly 5,000 dairy cows of two different breeds: Jersey and Frisona. They are reared on fodder grown in Ferrarini’s 1200-hectare (3,000-acre) farmlands and stored in our barns. The diet and health of our cows are constantly monitored by our vets, through daily checks and precise feeding plans. The combination of classic Frisona cow’s milk and its fattier, creamier Jersey counterpart gives our Parmigiano Reggiano PDO cheese its subtle, distinctive flavor. Our cows produce over 600 quintals litres of milk every day. The milk is then delivered to our two creameries, both of which are within 15 km of our farms, keeping the environmental impact to a minimum. 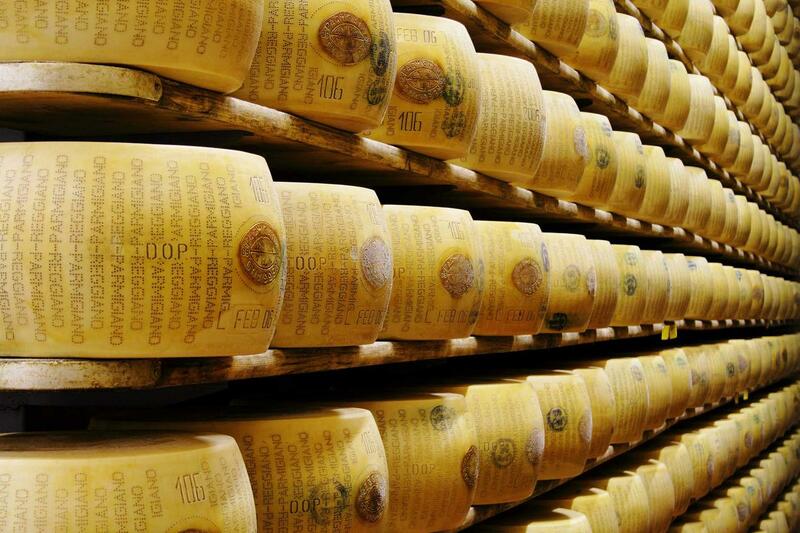 Over 100 cheeses are produced every day in our two Ferrarini creameries. These are located in the heart of the Emilian hills, in Puianello (Reggio Emilia) and Castelnuovo Monti, in the Reggiano Apennines. Ferrarini Parmigiano Reggiano cheese is produced exclusively using milk from our own cows, which are reared on fodder grown on our own farms. Thanks to certified quality control systems, Ferrarini can monitor the entire production chain. This, together with the experience of our cheese makers, gives Ferrarini Parmigiano Reggiano its unique, exclusive flavour. We are also able to offer a selection of GMO-free Parmigiano Reggiano and GMO-free butter, produced with milk obtained from a breeding process that uses no genetically modified foodstuffs. Take a look at how we produce our Ferrarini GMO-free Parmigiano Reggiano and butter, which are made exclusively using milk from cows reared on our farms. Enjoy a taste of our Parmigiano Reggiano cheese in the comfort of your own home! Is Parmigiano Reggiano a natural product? The milk used for our cheese is raw, as excessive heat treatment would reduce the bacterial flora typical of the local area. Parmigiano Reggiano is therefore a natural, local product, right down to its tiniest particles – invisible to the naked eye – such as lactic bacteria. It is these bacteria that facilitate the creation of the cheese, giving the finished product its characteristic aroma.However, this is not enough. To allow the good (lactic) bacteria to multiply naturally for 24 hours, tradition dictates that the whey produced from the previous step should be added every day to the milk. This laborious process is the only way of avoiding using whey created in a laboratory. Finally, the rennet is never produced using microbial cultures; it is always natural, following a tradition that has continued for over nine centuries. How can you recognise Parmigiano Reggiano PDO? With his hammer, the expert of the Consorzio taps the cheese at various points while listening carefully to the way the crust takes the blows. This tells him what is going on inside in much the same way as a stethoscope does. The cheese is then pierced with the screw-needle to extract a minute sample of the contents. The resistance of the Parmigiano Reggiano cheese indicates something of its internal consistency, and the sample enables the expert to judge the aroma and degree of maturation. The sampling dowel is resorted to only in exceptional cases, when the aforementioned methods have failed to elicit a diagnosis. Do you use animal or vegetable rennet? Every day, milk from the evening milking session is left to rest overnight in large tanks, which allows the high-fat cream part to surface, for the production of butter. After being poured into traditional copper boilers with a classic upturned bell shape, the skimmed evening milk is combined with veal rennet and whey inoculum, which is rich in natural lactic enzymes, from the previous day’s batch. The use of animal rennet – as opposed to vegetable or synthetic varieties – is considered compulsory by the consortium that oversees the production of Parmigiano Reggiano PDO cheese, and is one of the most traditional elements of the production process. Why is it so suitable for people who love sport? No less than 16 litres of top-quality, local milk are needed to produce 1kg of Parmigiano Reggiano. The result is a nutrient-rich cheese full of protein, vitamins, phosphorus and calcium, all of which stay active throughout the long maturing process. What’s more, Parmigiano Reggiano is rich in essential amino acids and is easily assimilated thanks to the presence of enzymes that modify the casein, making it readily digestible. Parmigiano Reggiano cheese is a perfect product for good health and good mental and physical wellbeing: it’s delicious, easily digestible and 100% natural. Rich in nutrients, Parmigiano Reggiano is ideal for supporting growth in young children, for good health in adolescents and the elderly and for guaranteeing high energy levels for lovers of sport. How long can I keep the cheese in the fridge after opening and how should I store it? Once opened, the packet must be kept in the fridge. If covered with a tea towel, the cheese can last up to 7/10 days. What are the crystals you can feel when you bite into Parmigiano Reggiano PDO? These are granules of Tyrosine, an amino acid which crystallises over a minimum maturing period of 16-18 months, resulting in the tiny crystals you feel when you eat the cheese. What are the differences between Parmigiano Reggiano and Grana Padano? Parmigiano Reggiano and Grana Padano are both great Italian products and symbols of the country the world over. They are very similar cheeses, with practically identical technological processes used in their production. The maturing process and the diet of the dairy cows are the principal differences, and Parmigiano Reggiano has a smaller area of production and is subject to more stringent regulations in terms of preservatives and labelling. Do you know the History of Parmigiano Reggiano? Ferrarini tells the History of Parmigiano Reggiano. What is the Protection Consortium? The Protection Consortium is an association of all cheese makers. It is officially tasked with awarding marks and labels to products that conform with Protected Designation of Origin (PDO) specifications, with certification from a third-party control body. The consortium is responsible for checking that marks are used correctly and for protecting against counterfeiting. It has the objective of spreading and promoting knowledge and consumption of PDO products and improving and perfecting them in order to preserve their characteristic features. Parmigiano Reggiano is a PDO product. The acronym stands for Protected Designation of Origin, and indicates products intrinsically linked to the geographical area from which they take their name. They are characterised by very specific conditions: the production of raw materials and their transformation into the finished product must occur in the area from which they take their name, and the quality or characteristics of the product must be able to be traced back to the geographical area of origin, in terms of natural or human factors such as climate, soil quality and local expertise.